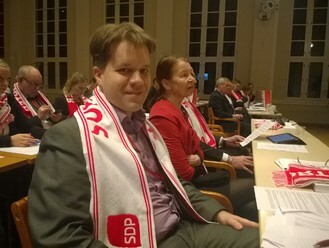 Ville Jalovaara is a 39-years old candidate for the Parliament, and is already a member of Helsinki City Council for the Social Democratic Party. Father of two, he is an historian, associate professor (docent) at the University of Helsinki. He has lived for the last eighteen years in Vuosaari, Helsinki. He has a good understanding of Finnish political history, as he has written his doctorate thesis on the relations between President Kekkonen and the Finnish church. He has then been specialising in the role of religion in Finland during the Cold War and then has worked on the different forms of poverty and the way Helsinki has dealt with it in the last 130 years in his academic research at the University of Helsinki. What kind of positive skills do you bring on the political scene? As an historian, I have been specialising in the Finnish history during the Cold War, which I think is needed in the Finnish Parliament, especially with the international situation. We have all kinds of tensions around, which make you think that we are a little bit in a cold war situation once again. In 2008, I did not get a permanent workplace with my doctorate, and I had quite a lot of difficulties getting a work, and it finally pushed me into politics to try to improve the employment of academics, and more generally educated people. But I have been always interested in politics, and one of my friends called me when there was local election in 2008, asking if I would be a candidate for the Social Democratic Party. It was a good time for me, I was elected actually four years later in 2012 elections. Many of my friends are involved in the SDP, and I have been actively involved for the last seven years. Why the Social Democratic Party? I think that it is a party about work, with values that I can easily make mine, such as solidarity, and equality, and the fact that there is an emphasis on the working life issues is for me very important. Of all the possible parties in Finland, it was for me the most reasonable option, and many of my friends are involved, so it looked like it was the right direction. Of course, I have not been active in politics before 2008. How did you get support in the party from more senior politicians? I have been mostly quite active myself. I was first the leader of our local party organisation in Vuosaari, I was leading that small organisation for a few years, and I had some friends who are now in the Parliament who have given me help, advice and encouragements. What do you see as the main challenges in the next years for Finland? It is mainly about employment, of course. If we get the employment rate higher, we can overcome the present economic difficulties and play our important role in stabilising Northern Europe. How would you propose to overcome these difficulties? I would be already Prime Minister if I would know the exact answer to that question! I think that we would need more support and encouragement for entrepreneurs, globally for private enterprises, but also for small firms. It could be with a bit lower tax on goods and services benefiting small companies, and other forms of support for people to begin a new company. The Social Democratic Party was in the beginning the party of small enterprises, and I hope that we will get some general agreement about employment, in the same way that we did 3 years ago, with moderate pay rises. And also I feel that Finnish companies could be very useful to intervene in Asia on environment related issues, as we have very high level clean-tech enterprises. I also hope that the situation with Russia and Ukraine will become more stable, so that the Finnish trade relations would improve. There is not one single solution for our difficulties, but we are good at adapting to new situations, so I believe that the situation will improve. But your party is in the present coalition. So what went wrong? Very good question! It has been quite difficult to manage, as at first there has been so many parties. One of the problems was that the Finns party in some way won the elections, and they did not want to go in the government. So they had many seats in the Parliament, but instead of taking their responsibilities they have just been complaining. And on the parties who went down in the elections formed the Government with the leadership of the National Coalition party. It has been a very difficult situation, with so many parties who have had a lot of disagreements, in particular concerning the economic line. Then a number of ministers have left for different reasons, and it has not been very good. We have had our congress during this time. It was quite a natural thing actually, there were elections about the party leader, and the party leadership was changed, and now Mrs. Urpilainen is one of the leading candidates for election. I am very happy about this. I think that we have now overcome this crisis, and all goes much better now inside the party. On the economic side, the National Coalition Party and the Centre Party propose serious budget cuts. Antti Rinne has also supported this idea. What do you think? He supports it to some extent, but not so much as the others. He is more worried about the way to get economic growth. It is the same in the Helsinki City Council: the NCP is always worried about taking loans and always want cuts, and we are more worried about the economic situation and the consequences at the workplace, or health care standards… In fact how to lead this country has been a big problem during these times. Is it a debate inside the party also? Not so much at the moment actually. As far as I know, Antti Rinne’s view are quite supported at the moment. Once you will be in the Parliament, what would be the first law that you would like to see on your table? It would be a law related to this part-time working problems I would like that we do something about academics who are obliged frequently to work part-time nowadays, and we have about 40 000 people who have an academic background and have no work at all… I would put on the agenda these issues, as they are important for our country. As an historian going into politics, what would be your recommendation concerning the relations with Russia? I hope that this situation in Ukraine will soon calm down, as we have so many big challenges in the world today, with for example the Middle-East problems and movements like the terrorist group ISIS, it is not a very good idea for Russia and the West to start being in such a bad terms for a long period. It could destabilise more or less the whole world. What about the Greek crisis? I hope that there will be some kind of long term agreement. In my opinion, it was a big mistake to accept Greece in the eurozone, as they have a different approach to economy and finance. But it has happened, so we have to find a deal suitable for the EU and also try to some extent to listen to the Greek people, who have also suffered much from the present crisis. As you have studied it, what is the role of religion in politics in Finland? Nowadays, it is not so important, the Christian Democratic Party is so small. In old time the NCP was very near the church, 40 years ago, but now it is not the case. The other are quite neutral, and the Church does not want to be involved in politics nowadays, it WAS different in Kekkonen’s time. There are however some kind of links, with some money from the state or municipality to the church to fund social activities, the President goes to the church’s celebration. The Church takes care of old historical churches. It goes quite well. I have launched it mid-February, and I have a group of 15 to 20 persons working with me, and as a candidate I am very glad to have this kind of support. I do a lot of campaigning in Internet, in magazines, in the metro… And the work I do in the Helsinki City Council, as a vice-chairman of our social democratic group should speak for me. It has been a challenging and interesting work. In addition, I am a very active member of the Helsinki Board of Education. What about education in Finland? Concerning Finnish schools, I would like to add that we have a very good system of schools, but the challenge now is to ensure the same standard of education everywhere. People consider that there are better schools, and not so good schools, it would be important to make an effort to improve quality in certain zones, such as Helsinki suburbs. You followed the shootings in Paris and in Copenhagen. What do you think should be done in Finland? We have had some events in Finland, such as shootings in Finnish schools. We do not call it terrorism, but to my understanding there is something common. So we need more dialogue with all the groups in the society, with for example the leaders of the different religions, with the idea that Finland is a welcoming and peaceful country. And also the policy need probably more possibilities to follow what happens, as what happened in Sweden, Norway, Denmark may happen here, Finland is not some kind of isolated island. For example we have to look after the security of the foreign embassies. More generally, we must not live in fear and try to isolate ourselves from the rest of the world, we must be an open society, as it would be against the Finnish traditional values to start to live in fear.